Chester, PA – Widener season-opening victory at then No. 15 Rowan went noticed by those on the national level as the squad received votes in the latest D3Football.com Top 25 Poll. Widener received 44 points, the most by any school not in the top 25. Wisconsin-Oshkosh is 25th in the nation with 45 points and Rowan fell out of the top 25, receiving 20 points. The notoriety certainly is deserved after the Pride’s 19-7 season opening victory Friday over the Profs. Widener’s defense had an outstanding contest, forcing seven turnovers that included six interceptions and a game-clinching 39-yard interception return for a touchdown by sophomore Sean Titus (Lancaster, PA/Lancaster Catholic) with 3:21 left. Rowan also was held to a mere 113 rushing yards and 246 yards of total offense. The game also saw senior All-America Anthony Davis (Upland, PA/Chester) break the school’s career receptions record. He ended the contest with seven and now has 194 for his career, besting the mark of 188 held by Tyreak Saviour (2001-04). The victory also is the first at Widener for new head coach Mike Kelly. He becomes the first to win their initial game at Widener since Bill Zwaan led the charge to a victory in 1997 over Wilkes. Widener, which has won a league-record two NCAA championships and 19 Middle Atlantic Conference titles, entered the season ranked 25th according to Lindy’s Sports Magazine in its preseason poll. The magazine only does one poll during the season. 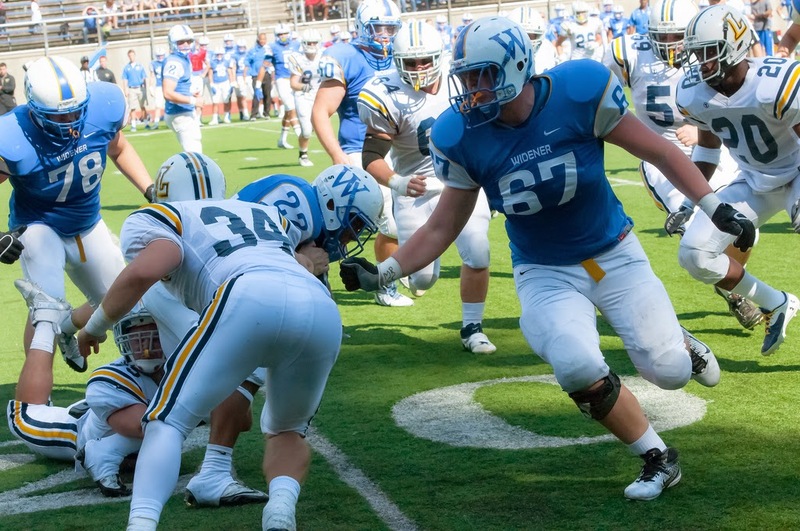 Widener looks to continue the momentum Saturday at Lebanon Valley in the MAC opener at 1:00 pm in Annville, PA.